When people are trying to lose weight or attempting to eat a more healthy and balanced diet, they often search for foods that fill you up without adding too many calories to your daily intake. The goal is to feel full so that you are not tempted to snack or overeat. This kind of strategy can make attaining your weight loss goal much easier. Most people hate going on diets because they feel like they’re hungry all the time. The good news is that there are many healthy foods that really do fill you up. However, you may be surprised which foods did not make the cut, even though they may be considered healthy choices. 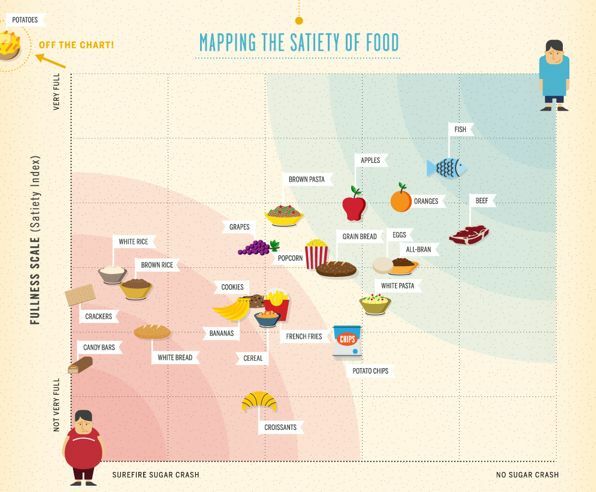 Read on to discover about the satiety index and the glycemic index and how they affect you. The Satiety Index basically ranks different foods on their ability to satisfy hunger short-term. If you can eat a portion of a type of food and feel full for about two hours, it will score high on the Satiety Index. The high scoring foods discourage snacking because you feel full from your meal and don’t have the desire for more food. Since foods are often digested slowly or quickly depending on their type, this affects your feeling of hunger. If you eat a quick digesting food, chances are you will feel hungry again sooner. As a general rule, foods with higher fiber, water and protein will satisfy for longer. The Glycemic Index shows how carbohydrates in your diet affect your blood sugar levels. If you eat foods with a high glycemic index, they are usually digested more quickly and can produce a sharp rise in your blood sugar when ingested. Low glycemic index foods digest more slowly and cause a modest or gradual increase in your blood sugar. These are also the types of food that will cause you to feel full longer and won’t give you a blood sugar crash later on. To eat foods that fill you up the right way, choose items that score high on the Satiety Index. 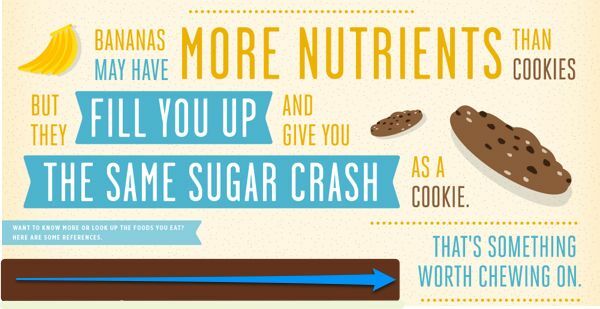 To avoid a sugar crash, choose foods that score low on the Glycemic Index. Picking the right foods to fill you up can mean the difference between wanting one snack throughout the day or up to five. Fish, oranges, apples, beef, all-bran, eggs, brown pastas, and grain bread all score high to moderate on the Satiety Index. These types of food will help you feel full and you won’t feel like snacking later. Like oranges, bananas may seem like a healthy fruit choice. However, on the Satiety Index, bananas ranked at the same level as cookies and popcorn. Bananas certainly have more nutrients than either popcorn or cookies, but they can actually give you the same sugar crash as a cookie. So instead of bananas, have some oranges as your choice of fruit!